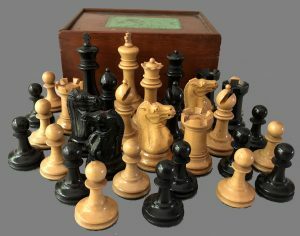 Offered here is a rare, unmolested set of Antique Jaques Hartston Tournament Chessmen, circa 1890. This is a very special find. 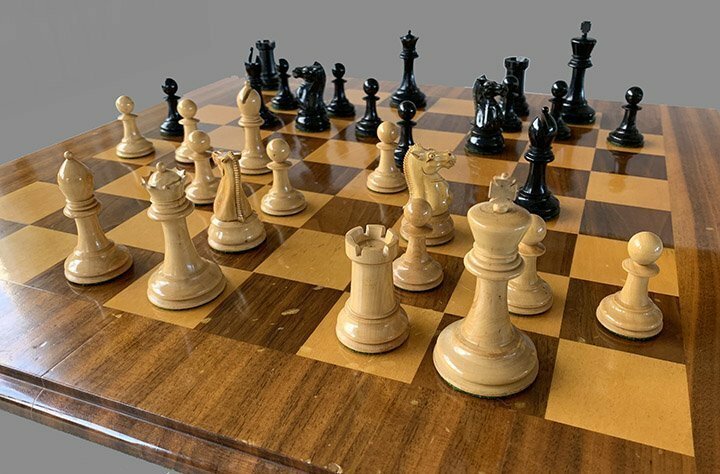 These magnificent chess pieces are like new! 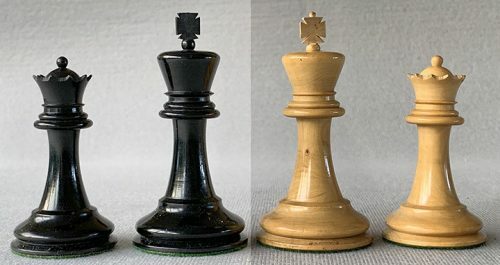 The Staunton chessmen are Boxwood and Ebony. The King stands 3-1/2″ tall with a 1-3/4″ diameter base. The chessmen rest atop green English baize and are nicely weighted. The Knights are of the Hartston style. 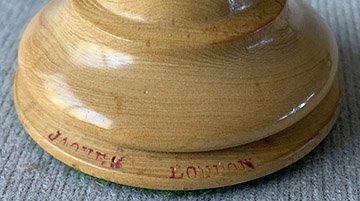 Only the white King is stamped “Jaques London ” on the rim of the base of their base, indicating that this is an Early Hartston set. The Kingside Rooks and Knights are stamped with a red King’s crown on their summits. This King height is often referred to as the “Tournament Size.” The Knights are very finely carved. 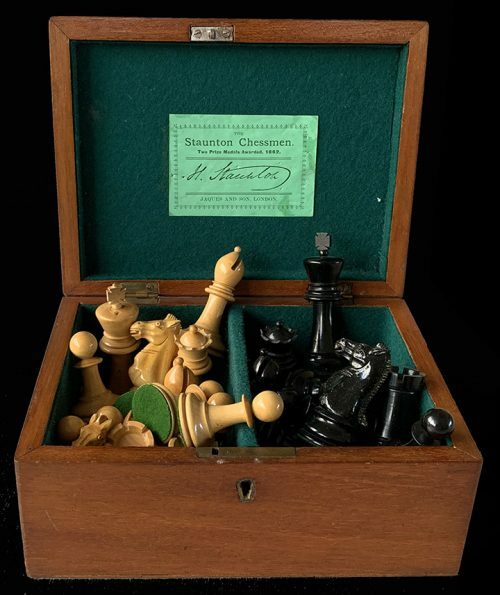 The Jaques Hartston Tournament Chessmen are housed in their original Mahogany hinge-top box with a semi-mortise lock set and correct green label, according to the Camaratta Codex of Jaques Labels. 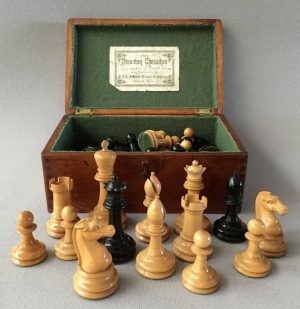 These early Jaques Hartston Tournament chessmen were produced around 1890. 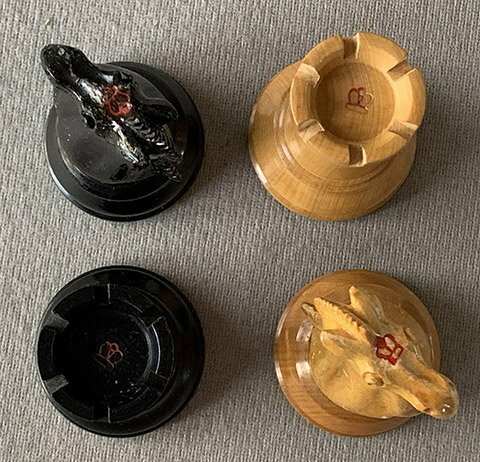 The chess pieces and box are like new. The label is crisp, although it does show some minor staining. A finer example of an authentic set of weighted Jaques Hartston Tournament Chessmen does not exist! 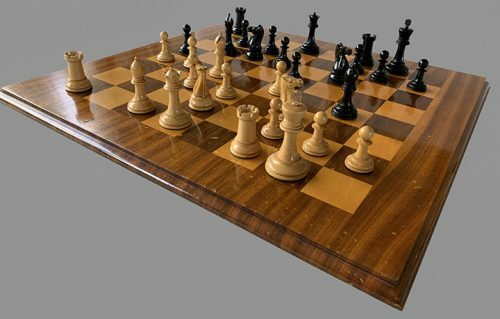 The chess pieces play and display best on a chessboard with 2-1/8″ or 2-1/4″ squares. 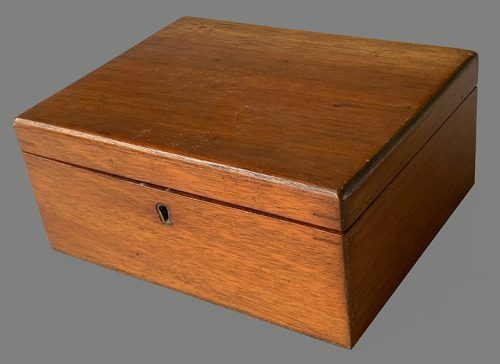 The antique chessboard shown is not included. A suitable chessboard can be found here. 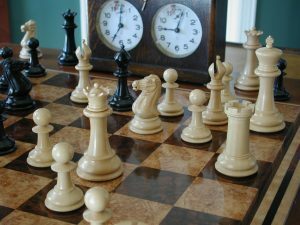 An extensive inventory of antique and contemporary chess timers can be found by clicking here. Finally, a brief history of the John Jaques company and the Staunton chessmen can be found here and here. These are they type of chess pieces that would have been popular during Harry Nelson Pillsbury’s ascension to prominence in the Chess World. Harry Nelson Pillsbury was born on December 5, 1872 and died prematurely due to syphilis on June 17, 1906. Pillsbury was a leading American chess player. At the age of 22, he won one of the strongest tournaments of the time, the Hastings 1895 chess tournament. His subsequent illness and early death prevented his challenging for the World Chess Championship. 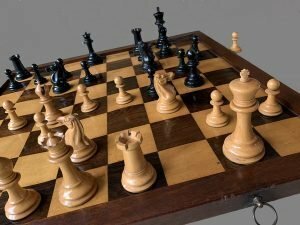 By 1890, having only played chess for two years, he beat the experienced tournament player H. N. Stone. 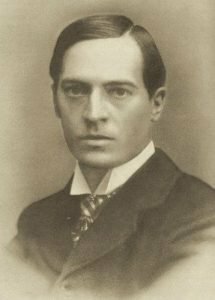 In April 1892, Pillsbury won a match two games to one against World Champion Wilhelm Steinitz, who gave him odds of a pawn. Pillsbury’s rise was meteoric, and there was soon no one to challenge him in the New York chess scene. The Brooklyn chess club sponsored his journey to Europe to play in the Hastings 1895 chess tournament, in which all the World’s leading players participated. The 22-year-old Pillsbury became a celebrity in the United States and abroad by winning the tournament, finishing ahead of reigning world champion Emanuel Lasker, former world champion Wilhelm Steinitz, recent challengers Mikhail Chigorin and Isidor Gunsberg, and future challengers Siegbert Tarrasch, Carl Schlechter and Dawid Janowski. The dynamic style that Pillsbury exhibited during the tournament also helped to popularize the Queen’s Gambit during the 1890s, including his famous win over Siegbert Tarrasch. His next major tournament was in Saint Petersburg 1895. This was a round-robin tournament among four of the top five finishers at Hastings, Pillsbury, Chigorin, Lasker and Steinitz. Tarrasch declined to compete. It is rumored that Pillsbury contracted syphilis prior to the start of the event. Although he was in the lead after the first half of the tournament (Pillsbury 6½ points out of 9, Lasker 5½, Steinitz 4½, Chigorin 1½), he was affected by severe headaches and scored only 1½/9 in the second half, ultimately finishing third behind Lasker and Steinitz. He lost a critical fourth cycle encounter against Emanuel Lasker. Garry Kasparov has suggested that had Pillsbury won, he could well have won the tournament and forced a world championship match against Lasker. In spite of his ill-health, Pillsbury defeated American champion Jackson Showalter in 1897 to win the U.S. Chess Championship. He held this title he held until his death in 1906.Poor mental and physical health, the result of a syphilis infection, had prevented him from realizing his full potential. He succumbed to the illness in a Philadelphia hospital in 1906. Pillsbury is buried in Laurel Hill Cemetery in Reading, Massachusetts.